In this week’s column, I examine two related questions about moving podcasts and music from one Mac to another while retaining metadata. I also look at a question about smart playlists built around specific words, and explain an easy way to create a text file with a list of all your playlists. Q: Can you tell me how to move podcasts from an old Mac to a new Mac without losing all of the important metadata: played status, time remaining, and so on? While I have an answer to this question, I’ll couch it in multiple caveats. iTunes’ podcast management is close to being disastrous since iTunes 11. It is hard to understand—even for the iTunes Guy—and it’s unreliable. Some users find it works just as they want; others want to pull their hair out and switch to other apps to manage podcasts. But here’s a suggestion that might work if you don’t have too many podcasts, and if you don’t have podcasts that are old enough to not be in the iTunes podcast feeds any more. Rather than transfer podcasts from one Mac to another—which would lose some metadata—I’m going to show you how to create a podcast station, that should sync all this information to the new Mac. But, again, this may not work as desired. Creating a station with all your podcasts allows you to sync your podcast subscriptions and metadata to other Macs and iOS devices. Double-click untitled station and give the station a name, such as All Podcasts. At the right side of the window, next to Include all podcasts, move the slider to the on position and click Done at the bottom. Now launch iTunes on the new Mac. Make sure you’re signed into your iTunes Store account, wait a minute or two, and you should see the station appear in the Podcasts section. Click My Podcasts, where you’ll see a list of podcasts in the station. Right-click on each podcast and choose Download All to get copies of all the files on the new Mac. They should retain information about whether you’ve listened to them or not, and where you stopped if you haven’t listened to them completely. Q: How can I move a playlist of songs from one Mac to another, keeping all the metadata, including ratings, play counts, last played date, and so on? I chose to put this question after the previous one, about podcasts, to show two related questions with very different solutions. There are two answers to this question. If you have iTunes Match, and it’s active on both Macs, then the playlist should sync from one Mac to another with all the metadata. But syncing is sometimes unreliable, with play counts and last played dates not updating consistently. If you don’t have iTunes Match, you can manually move a playlist, but you can’t retain ratings, play counts, and the like. 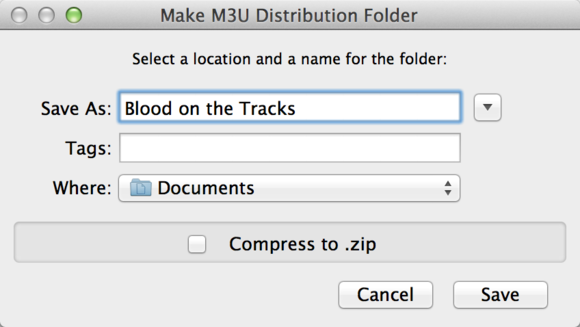 Doug Adams’ Make M3U Distribution Folder AppleScript (payment requested) can help you move a playlist and its songs with just a couple of clicks. 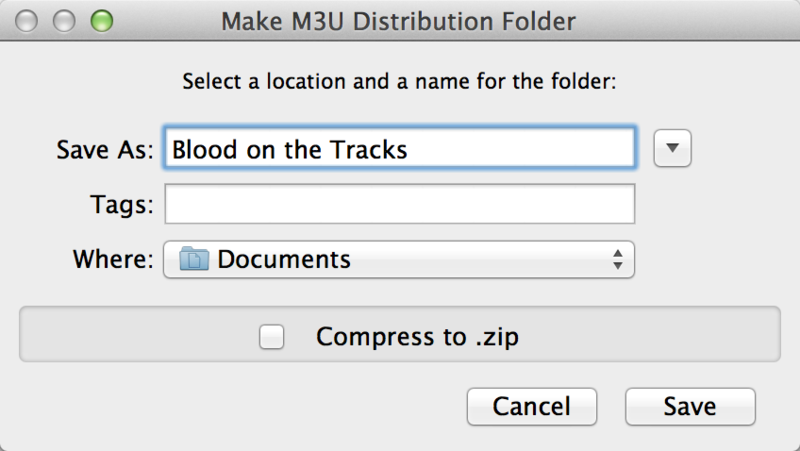 Make M3U Distribution Folder creates a folder with a playlist and all its songs. Select a playlist in iTunes, then launch the applet. It prompts you to enter the name for the folder where it will put its .m3u file (which iTunes will later use to create the playlist) and media. Choose whether or not you want this compressed to a zip archive, then click Save. The applet copies all the files and creates the .m3u file. Copy this folder (or archive) to another Mac, then double-click the .m3u file. iTunes reads this, creates the playlist, and imports all the songs. Be careful, though; if any of the files are already on the other Mac, iTunes will create duplicates because it will import all the songs. So you might want to sort through the tracks manually first. Q: I made smart playlists for whimsical things like rain songs—those with rain in their names—when it’s been very rainy. When you do that, you also get songs about trains and brains. Same thing for a playlist with song names about tea. I wanted to make a playlist for a friend starting a tea business. Besides the songs I wanted, I got songs with tears, teach, steam, and anteater. Is there an obvious way to do this that I am missing? There is, but it’s not perfect: Create a smart playlist where Name contains a word and a space before and/or after the word. Depending on where you put the space(s) the results will be different. If you put a space after “tea,” you won’t get songs like Nirvana’s “Pennyroyal Tea”. If you put the space at the beginning, you won’t get, for example, Cat Steven’s “Tea for the Tillerman” or the Police’s “Tea in the Sahara”, but you will get Joy Division’s “Love Will Tear Us Apart” and Bob Dylan’s “Where Teardrops Fall”. And if you put a space before and after the word, you’ll only get songs with the word tea somewhere in the middle—of which there are very few, but it might work better with other words. You can search for whole words in smart playlists if you use a space before and/or after a word. So while it works in principle, it’s not perfect. Obviously, your results will depend on which words you choose. Q: Being a music lover, I now have perhaps a couple hundred playlists. For reference purposes, I’d love to be able to print out a listing of all those alphabetized titles that appear in the far left-hand column of my iTunes library. It’d also be nice to be able to have them in a Word document so I could email that list to any family members and friends who are interested in comparing their music files with mine. From your question, I wonder if you wouldn’t be better off printing a list of your albums, as I explain in a previous column. But if you do want a list of playlists, Doug Adams comes to the rescue again, with his Playlist Names to Text File AppleScript (payment requested). Launch the script, and it will ask for a location to save a text file. You can then open that file in any app—such as Microsoft Word—and see all of your playlists. You can also email the contents, or save it as a note so you have it on your iOS device.